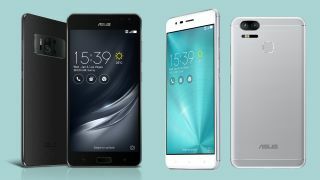 Asus announced a dynamic duo of Android Nougat smartphones for 2017 that offer some insanely powerful specs. First up is the Asus ZenFone AR, which isn’t much of a surprise thanks to Qualcomm’s accidental leak a few days ago. However, we know a lot more about the device now, including that the Snapdragon 821-equipped phone will have an enormous 8GB of RAM and sport a 2,560 x 1,400 super AMOLED display. That RAM actually has a use now, as this is the first phone to run both Google Tango and Google Daydream experiences, making it one of the most futureproof smartphones to hit the market to date and needs that extra processing power. Compared to the Lenovo Phab 2 Pro, a phone that paved the way as the first Tango phone, Asus’ more powerful smartphone will run laps around it. Asus is also touting the camera setup in the ZenFone AR outside of its most obvious use case, Google’s AR app Tango. Aside from its comprehensive manual mode, the Zenfone AR has Super Resolution mode that Asus claims can capture four photos shot in native 23MP and stitch them into a single 92MP image. This is made possible from a Sony IMX318 sensor that has 4-axis optical image stabilization (OIS) for photos and 3-axis electronic image stabilization (EIS) for videos to ensure a stutter-free recording. Of course, all of this technology will very likely come at a high cost, and Asus isn’t talking price just yet, although the Asus Zenfone AR release date has been set for the second quarter of this year, so we'll have it in our hands by June. If you don’t need all of that newfangled tech, but still want a capable camera, the Asus ZenFone Zoom 3 might suit your needs - and it comes with a huge battery to help you do that. Last year’s Asus ZenFone Zoom rocked a premium, if divisive, leather-inspired design that drew the eyes toward its circular, dual-camera setup. This year’s model ditches almost every unique aspect in favor of a more mainstream look. The 5.5-inch Super AMOLED-screen-packing, Snapdragon 625-powered smartphone has a 12MP wide-angle lens with a respectable aperture value of f/1.7, and another sensor dedicated to more serious shots. The Sony IMX362 camera sensor on board shoots with 1.4 micron pixels, which are larger than many smartphones can capture and will make it more adept in low-light environments. Even if you're not into photography, this phone should be able to last a seriously long time, offering a large 5,000mAh battery. Fit inside of its 0.9mm-thin chassis, Asus boasts that it can last up to 40 days in standby mode, which is a long time to not be using the phone. Some other highlights include Android Nougat software, 4K video recording, RAW file support for greater post-processing flexibility, and a 13MP front-facing camera for better-than-average selfie. Lastly, the phone boasts a robust manual mode that lets users tweak every last setting, much like the one we enjoyed in the Zoom. The Asus ZenFone Zoom 3 release date is set for February, with the price released soon.